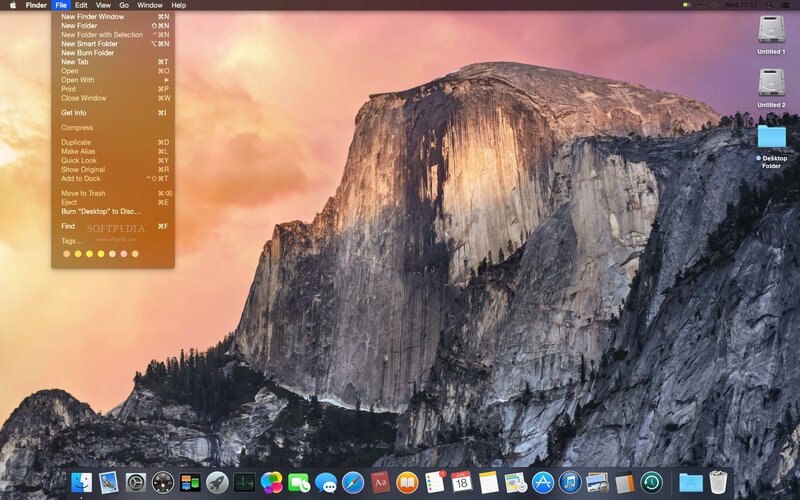 ComputerWorld, this morning, published some tips for Mac OS X 10.10 Yosemite beta testers. You should keep these tips in mind, especially since if you are a first time beta tester. "First and foremost, keep in mind that this isn't the official release of the software; Apple is still testing and tweaking Yosemite. That means it may not function as expected. Some features may be completely absent or could differ from what Apple showed off during its WWDC keynote in June -- and some features may look very different in the final release." 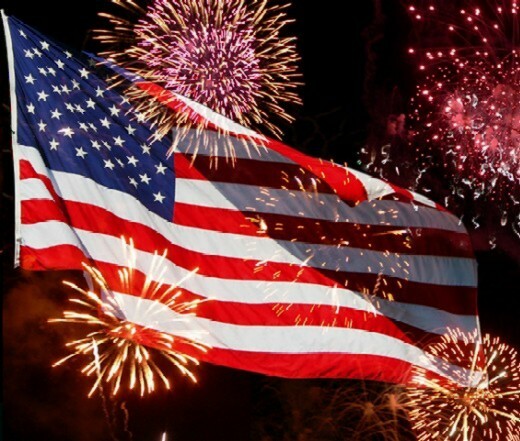 Head over to ComputerWorld to read the full article. When was the last time you saw one of theses? The Super Serial Card II from Apple was the serial card interface for the Apple ][ line of computers, including the wildly popular Apple ][e. This particular Apple serial card was released in 1981. 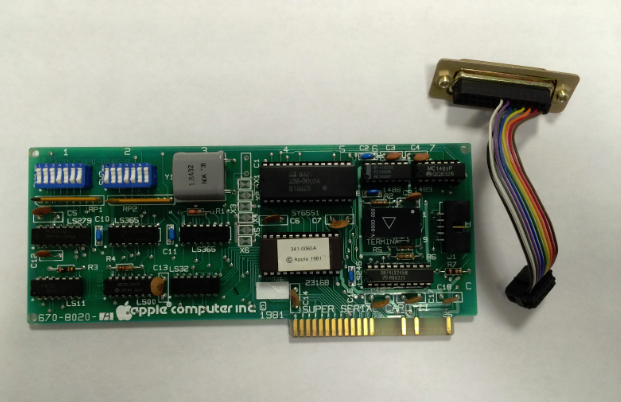 For more information about the back story and history of the Apple Super Serial Card II can be found over on Wikipedia. 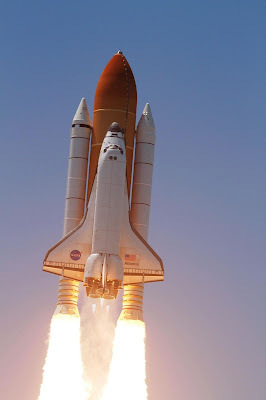 The NASA space shuttle program, officially known as the Space Transportation System, or STS, has always been something that truly impressed me ever since reading about it in school all the way back in 1980. I still miss seeing them leap off the pad and jump into space. Happy 4th of July from Smartphone Fanatics! Every year getting tickets to Apple's annual developer conference, WWDC, is a big hoopla. There are only 5,000 tickets available and it's really come down to the luck of the draw to get one. This year, Apple had done something different. They've made their breakout session videos available to anyone (i.e. : no developer account password required) to download and watch for free. I'm not a developer, nor do I play one on TV, but there are few sessions that look pretty interesting. Hit up the link below to see what interests you. I recommend that you download the videos that you are interested in, as there is no telling how load the site will remain up. Yesterday, Apple let a trio (or "Treo" for my long time readers) of updates for iOS, Mavericks, and Apple TV. 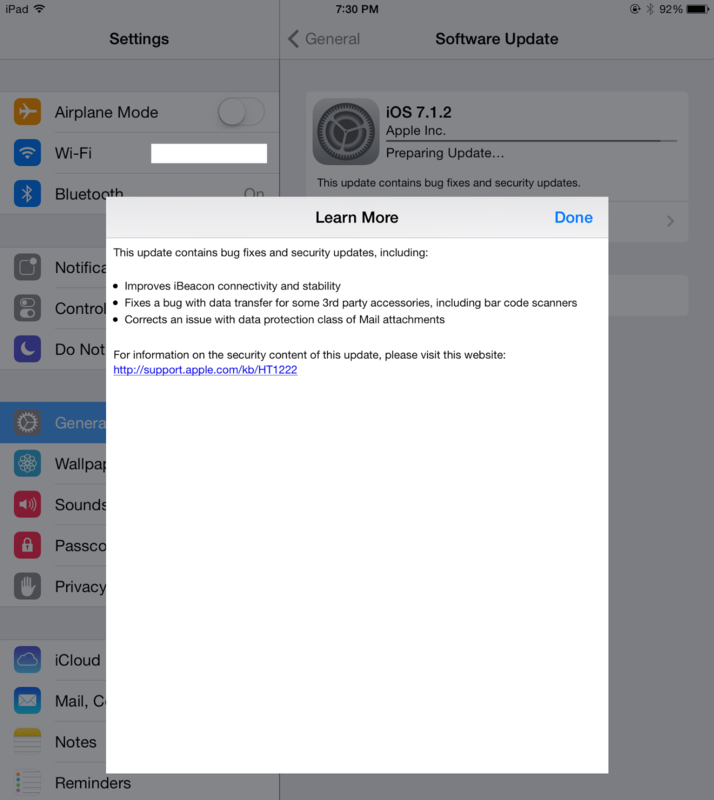 iOS 7.1.2 is minor security update for current model iPhone, iPad, and iPod touch devices. The 25MB delta update improves iBeacons connectivity, fixes issues related to some third-party accessory data transfers, and closes a hole in data protection for certain email attachments. The update is available now via the iOS Settings app > General > Software Updates. The update should install on any device that is already running iOS 7.
iOS 7.12 is expected to be the last iOS 7 maintenance update before the iOS 8 release that is coming this fall. 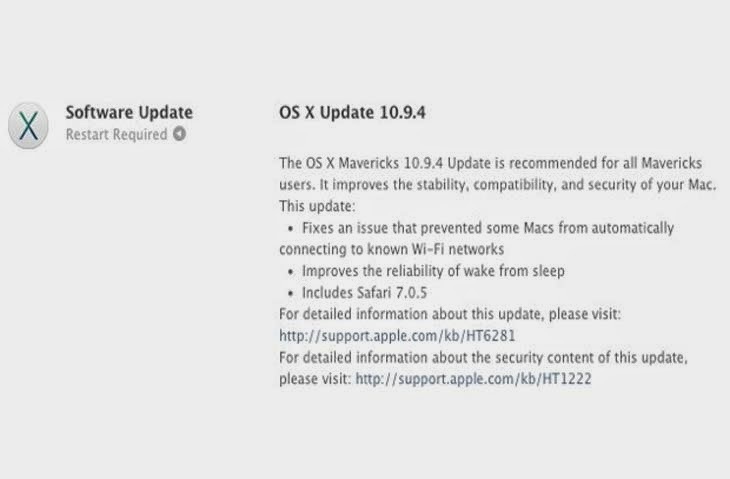 Similar to iOS, Mavericks 10.9.4 is a minor update that corrects some Wi-Fi connection issues, fixes relating to waking up a sleeping Mac, and a minor Safari update. The update is available now via the Mac App Store. 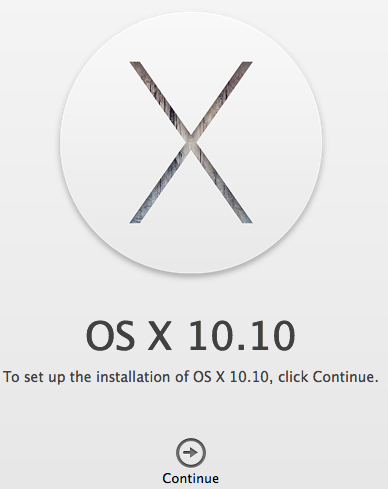 For more information about the OS X Mavericks 10.9.4 update, please review Apple's 10.9.4 update KB article. Along side of the iOS and OS X update, the Apple TV got a little boost to OS 6.2. There does not appear to be any outward software changes, leaving us to assume that the update is strictly a bug fix maintenance release. Earlier this month at Apple's WWDC developer's conference, Craig Federighi, introduced us to the future of the Mac OS - OS X 10.10 Yosemite. With Yosemite, the Mac user interface remains familiar to long time Mac users and yet, have a clean new look. Long time and new Mac users will be able to walk up to the Mac and begin using it very quickly. OS X Mavericks was a nice upgrade from Mountain Lion, but the user interface across all of Apple's stock apps and icons looked disjointed. Some icons didn't change at all, such as Contacts, and then new apps, like iBooks, used the design language from iOS 7, and used the round orange ball with a white book. Similarly, apps like the aforementioned Contacts and Reminders apps just looked or functioned terribly. With Yosemite, Apple goes back under the direction of Jony Ive, and created a new cleaner, flatter, less cluttered design language for Mac OS X (1) and I think it looks really fantastic! And, for the first time in a long time, Apple will be including a sort of theme for OS X. You can chose from the standard "light" theme which looks much like the stock Mountain Lion and Mavericks theme with it's translucent or solid white menu bar or the new dark theme which uses a darker menu bar styling. For Yosemite, Apple has elected to keep the current list of compatible Macintosh hardware as it's predecessor, Mavericks. Essentially, any Macintosh that has a release date of "Mid 2007" or later will be able to run Yosemite. Well. That's a pretty generous range of hardware and means that my five year old 17-inch MacBook Pro will still be supported and will be able to run Apple's latest Mac operating system. Now there will be a catch, as with everything in life. Not all of Yosemite's features will be available on every Mac released since mid-2007. For example, my MacBook Pro won't support the new Handoff feature in Yosemite. That's because my Mac lacks the Bluetooth LE 4.0 hardware. That may chance by the time Yosemite is released this fall, but you get the idea. The take away here is that if you want all of the bells and whistles, you had better be running on the current or previous generation of hardware. Most customers will be installing Yosemite directly over the top of Mavericks or Mountain Lion. The software will be delivered over the Internet to your Mac via the Mac App Store. Just download the update installer (which, can take a long while) and you're off to the races. For this upgrade though, I'm thinking about doing a clean install of Mac OS X. Since getting my MacBook Pro, every OS upgrade has been an "over the top" upgrade. This time around, I want to do some house cleaning, so I'll be making a backup of my Macintosh HD with Carbon Copy Cloner, and then creating a bootable DVD of the Mac OS X Yosemite installer (a USB flash drive also works), and then erasing my disk and installing Yosemite "cleanly". It will be a little bit of extra work, but I think my Mac will run a little bit faster after clearing out the years of left over garbage that can build up over time. For more information on Mac OS X 10.10 Yosemite, check out the Apple OS X Yosemite preview website. (1) Yes, I keep calling "OS X" by it's old name, "Mac OS X". Some old habits die hard and this is no exception for me. 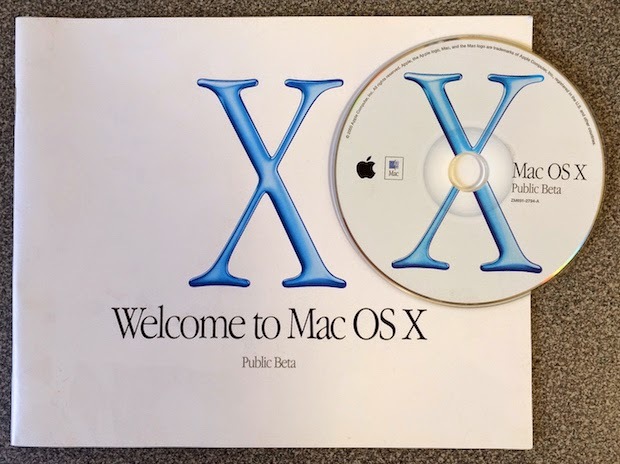 I really don't care that Apple is trying to make Mac OS X sound more like iOS by dropping "Mac" or "Macintosh" from their desktop operating system's name. I'm a Mac guy, the computer is a Macintosh, and so it's still Mac OS X for me. (2) OS X Yosemite is still in prerelease software development cycle know as "beta", which means it's up and running, but still has lots and lots of bugs in it. You're not going to install buggy beta software on your Mac's primary partition as your everyday OS are you? I'm not. (3) I just really, really don't want to give up the 17-inch display, even if newer Retain MacBook displays have a higher resolution.